There’s a lot of neat stuff in Carnevale and Rose’s The Undereducated American (and if you can’t read the whole thing, the first ten or so pages are essentially a Powerpoint of the findings — they will take you all of two minutes to flip through; you have no excuse). One of the arguments of those who claim we have a tuition bubble is that one in three graduates of college do not hold jobs that require a bachelor’s degree. If there really is such a demand for college graduates, the argument goes, then where are the jobs? …indicates just the opposite. It shows the median earnings of full-time, full-year workers in the occupational tiers for those with only a high school diploma and those with a Bachelor’s degree [in those professions where a Bachelor’s degree is not required]. 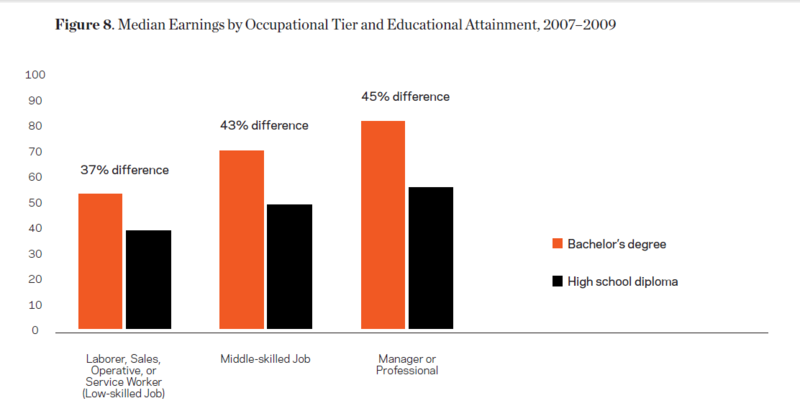 Within each occupational tier, those with Bachelor’s degrees earn between 37 to 45 percent more than those with only high school diplomas. In other words, employers place a premium on college degrees, even in the lower and middle-skilled jobs that don’t technically require such credentials. There’s certainly questions about what happens to this gap when you control for a variety of factors — how much of this holds when you control for race, or education level of parents? How does it look comparing within jobs at a more granular level? But I think at this point the onus is on the Tuition Bubblers to ante up.